I searched everywhere to find the most amazing RV remodel ideas and create a list, originally with the ten best RV renovation plans. Finally, in the second update, I did not select ten but more than thirty renovations performed by other RV fans like us. In the last update, I added seven sent by other RV fans who are involved in their own RV remodel projects. Send us the pictures and a description of your remodelling project, so we can feature it in this list as well. My favorite RV remodel ideas are #8, #9 and #23. Please let me know in the comments which are your favorite RV remodel implementations. Number 1 is the most voted by our readers so I moved it to place one. Number 24 is the second most voted in our Facebook page. For me the combination of colors is too strong in that one. So here are the RV remodel projects for you to see. Luxury Appointments including designer fabrics and furnishings, custom finishes, wool area rugs and hotel quality linens. This RV remodel is now for rent. The owners include Vera Wang china, stainless steel utensils and glasswear, all professionally cleaned, sterilized and packaged prior to each and every booking. Rhonna is a design specialist, and also specialized in custom printables and typefonts. So her knowledge is key for a project of this type. This is her RV remodel project. In design, it seems that she considers that the sky is the limit. Completely “do-it-yourself”. She installed a chandelier and painted the walls with a sophisticated turquoise color. She designed and manufactured her pillows and also the curtains. I wonder if during the road trip there can be an issue with the hanging chandelier. Note the touches of yellow in some of the objects and how she combines the colors in this beautiful RV remodel project. One of the many Airstream units that you will see in this list that went through an interior refurbishment process. Abundant tones of white, vintage furniture also in white. This RV remodel mixes simplicity and sophistication, all in one recreational vehicle. Just take a look at the “Before” picture in this RV remodel project as featured by Design Sponge. In South Africa, Grand Daddy Hotel owners, installed seven Airstream trailers in their roof terrace. They invited several local designers to work inside as a permanent exposition of beautiful Airstreams. The result of the rv remodel work performed by these local artists was astonishing, See the picture below. There are some dots that have three dimensions. Furthermore, you can open these dots and store small objects inside such as, for example, a pair of keys. The most important organizational institution for women with an RVing focus is Sisters on The Fly. These women are fans of outdoor living and RVs. The rv remodel done in this travel trailer is shown by one of their members. Very fifties style, the table that resembles a table from a diner, pillows with a kitsch styling and a lot of fun for this incredible association full of RV fans, people like us. I am a bit concerned about these chandeliers hanging when the travel trailer is on the road. This is an Rv remodel of a travel trailer featured by GetCampie (link below) that has maps as wallpapers. Maps are not expensive at all. The owner bought several maps, and using wallpaper paste, created his own custom wallpaper. A map in the wall resembles the travel and RVing orientation of the family that owns it. However, a good part of the recognition goes to the curtains, with red notes in combination with an overwhelming red bench. More an rv interior miniproject than an rv remodel as the others we feature. Worth to be part of this article. An internal project that now is with BASE, a company that specializes in landscape architecture. Apparently they are good at rv renovation as well. They took a 1959 Airstream and started this rv remodel project by stripping the paint revealing the riveting, and of course working with the typical Airstream signature: the aluminum. This was done to honor the original artistry and the craft behind this famous series of trailers. The space was created for a professional in design, who would be working many hours inside his RV. This justifies the large desk present in this rv remodel. 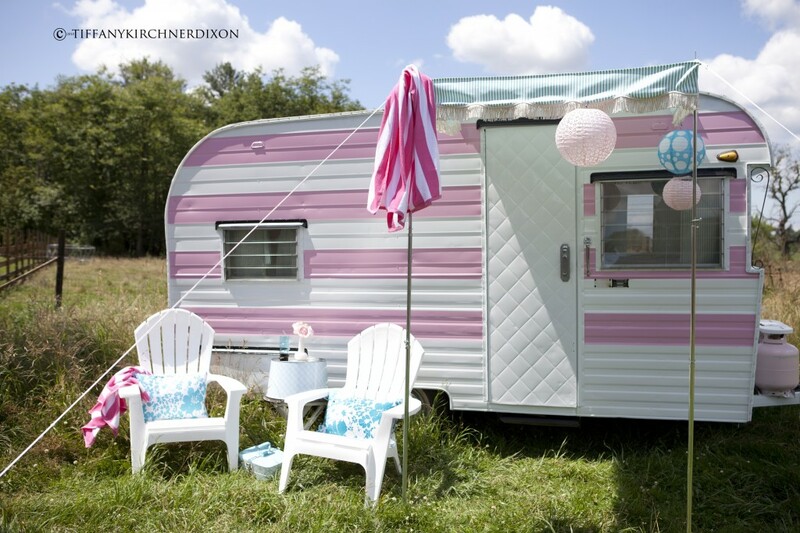 This model depicted below is a 1959 Aristocrat, that was subject of an overwhelming RV remodel diy by photographer Michelle Sullivan who is also a designer, from Orange. The floors in vinyl, pastel wallpapers, and distinctive notes of pink and an aggresive orange in the curtains. An impressive work from someone we knew only as a photographer. 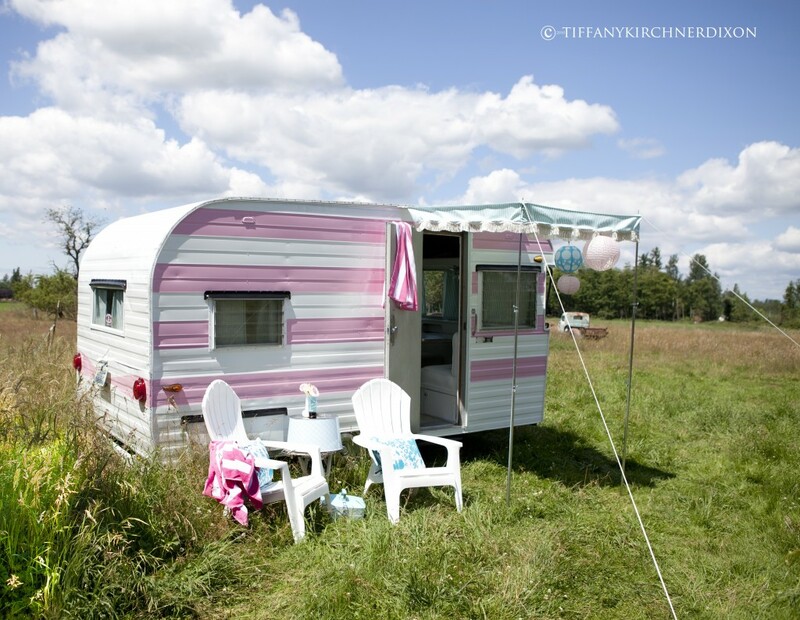 Her owner defined her as the cutest little trailer in a country mile. 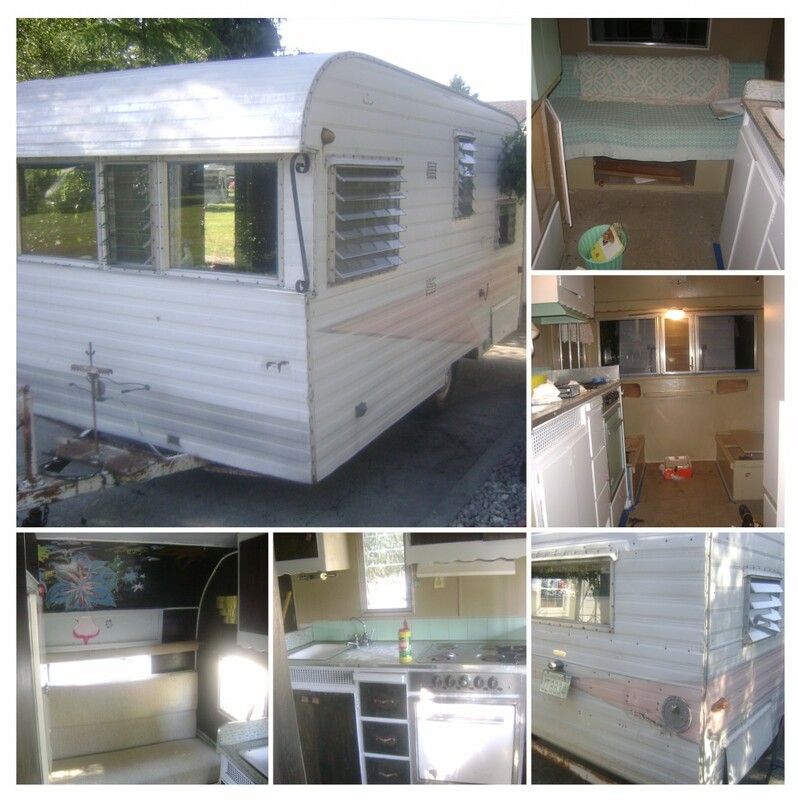 Below are the original photos of this travel trailer named Audree, manufactured more than sixty years ago. This is how she found her when she purchased it, before her rv remodel. Cute enough for sure, but black paint with neon accents, and rust covering her in places and years of aging in misplaced homes. Here is sweet little Audree after her extreme makeover!! Of course, she mentioned that she had to pay homage to her favorite happy color, Pink. For afterall, it singly embodies the vibe she wanted to convey through this RV remodel. Ok, enough rambling, back to her “after” photos!! This travel trailer combines style and vintage looks in one single vehicle. The owner, Denise, also provides creative camp activities and crafts for the camper, picnicker, scout or outdoors lover; young and old alike. According to her site “Each lesson lists the supplies you need, which are usually household or classroom items, to do each activity, and provides easy to follow step-by-step instructions”. You can check this rv remodel in her website. Denise Sabia, interior designer extraordinaire and author of “The Painted Home” blog, hits the road with The Crafty Camper. Denise and her caravan of crafts will be visiting area flea markets and craft shows selling her fabulous upcycle items as well as teaching classes to all those interested in learning her unique, fun approach to design. So whether you are looking to bring home a great new item or hang out and learn a few things from Denise, visit CraftyCamper.net, simply click on “On The Road” and check out where the crafty camper is heading next. See it all in CraftyCamper.com where she has more pictures of this rv remodel. As long as she can remember, captain, owner and designer; Charity D’Amato envisioned a lifetime of adventure accompanied by a silver bullet camper and in the summer of 2010 her dreams became reality with the purchase of Amelia. This 1972, twenty one feet Airstream, Globetrotter Land Yacht is a chic design haven for all things nautical. From the glorious shiny white aluminum and sunbrella sailcloth interiors to the captivating wall of “wavy” wallpaper that separates the kitchen from the head. This 125 square feet camper is dripping in nautical details after the rv remodel was finished. The camper was sold in 2016 and later also in 2018 according to the Airstream forum, it is completely gutted and rebuilt with new electrical, water and satellite systems. It sleeps two adults very comfortably and four adults snuggly. The rv remodel contains a twenty inch flat screen tv, complete with satellite antenna and a vintage DVD player for the best campground flicks. The unit is also outfitted with on-board BOSE ipod dock perfect for any yacht rock playlist and CD player complete with subwoofers for those hopping “glamping” soiree’s at a campground near you. The floorplan of this rv remodel boasts an open, airy and refined feeling complete with the Level™ suite of plumbing fixtures by Moen and specialty lighting by Hinkley Lighting; both Cleveland based companies. If you like to cook a new gas range top can be of help; while bakers will find the combination convection and microwave unit perfect for mixing up a batch of cupcakes to whoo your fellow campers. This is a couple that, as many other small families did, they downsized and moved to a refurbished camper for the next couple of years. They have also several dogs that are moving with them. They took the camper depicted below and they refurbished it completely, bringing it to the current century. One of the most exhausive rv remodel projects in this article. New cabinets, new floors completely laminated, but still a desirable vintage style. I recommend you to check their pictures in their site in a before-after style. Another refurbishment of a recreational vehicle to transform and remodel an old travel trailer. This was not a total RV remodel. Wild Flower Photos, is a family with three children who are dedicated exclusively to photography and this RV remodel was more a side project. The owner of this RV wished to keep the retro travel trailer looks of this 1966 vehicle. Unluckily, she did not explain too much about her RV remodel, so you can see a few more pictures in her website but not many details of this beautiful do-it-yourself project. Her site is There Is No Place Like Homemade. Of course, not the first Airstream in our list. Airstream models are even more beautiful after a complete refurbishment or remodel process. The RV remodel of these pictures is an Airstream of thirty one feet from 1973, Airstream Sovereign. Bellingham Thames presented recently the remodeling of their travel trailer and we decided to include it in this gallery for the latest update of or RV remodel listing. Due to an issue in the fiberglass shell and also due to the fact that the family was increasing its members, the owners of the Bellingham Thames blog, decided to start a complete RV remodel of their travel trailer. One of the most notorious additions was a solar array. The reason for this addition was that they frequently practice camping outside camp sites. therefore, they do not have access to shore power. Their recreational vehicle is winterized, but this is not enough without having access to energy. With the solar array, they have solved this issue. Laura and Cad decided to sell their huge house to start a new way of living in what they called their new “tiny home”. They now live in their winterized RV, that has 145 square feet. They share it with two dogs and two cats. Their main goal with this RV remodel, was to make it look like their home, and this is exactly what they achieved. Jorge and Angela Gallardo, from the Anchored Home Blog, that ceased to exist in 2018, bought a travel trailer. They decided to live in twenty eight feet long of space. What started as a simple kitchen rv remodel turned into a gradual tearing out of nearly every bit of the space. Painting one thing led to a need to paint another, and so on. I will not go into every little detail but I will give a brief rundown. The walls were atrocious so that was a given. Angela found an opportunity to use a can of paint that had been sitting in their garage for literally years with no previously revealed purpose made for a light and opening addition to the space. Doing away with the sad-looking laminate cabinets by painting them to match the upper kitchen cabinets. Keeping existing bedding, throw pillows, and curtains that coincidentally matched said painted walls. The kitchen. The center of their rv remodel. The “befores” are dismal at best, pretty much zero counter space and teensy tiny sink basins. They do not use a microwave much at all and felt the large vent hood took up too much space. So after taking a crowbar to this space, spending hours in IKEA’s kitchen design software, and with the help of a new friend and handyman to get the cabinets in securely, they are full on IN LOVE with the results of their rv remodel project. Room for the kitchen aid (sworn accidental match to the walls), Hurom juicer, and a 25″ basin sink! The stove is the only thing left from the original kitchen. Drawers and doors with soft close latches (a cheap addition that was well worth it). A water filter built in to the sink. Upper cabinet doors that swing upward and hold out of the way. Little details like a magnetic knife rack, adhesive backsplash, and under-mount lighting makes this kitchen soooo much more pretty and user-friendly. Removal of the banquette was a must and turned out beautifully for them as a work-from-homer. They purchased two identical slabs of laminate countertops from so the desk would match the kitchen. She was happ with all that natural light just flowing in at her desk every day! A new set of drawers was added under the desk for office storage. And a small freezer tucked under as added freezer space for the dogs raw food. Shelving above the desk holds props for work. Not much was done to the bathroom other than painting and fixture additions, extra towel bar, etc. Upgrading the shower nozzle to an eco-friendly, water-slowing head with an on/off switch added a good five minutes to their shower times and was quite possibly the most important change that Angela and Jorge made within the whole of the trailer. The small six-gallon water tank gave them a measly three minute hot shower before this change. They have plans to switch out the bathroom vanity to get more counter space and a less meltable sink (flat iron + plastic sink is a no-go for them) but didn’t make it into the budget initially. COST: They found the trailer on Craigslist and paid $6900. RV remodel costs totaled about $3500. FLOORING: They pulled up the laminate and carpet, cleared all remaining nails, and laid down a floating, locking vinyl system from Home Depot. It is called TrafficMaster Allure and they picked the color Ironwood. It is waterproof and you can cut it with a knife to fit your space. They used almost five entire boxes (about $225) in the rv remodel and laid it themselves. WALL PAINTING & COLOR: it’s a Frazee color called Rock Flour, code CL 2121W, in semi-gloss. They only removed the strip of wallpaper along the middle with Goo Gone and cleaned the walls well before painting. They used texted rollers, rather than foam, so it would have more of a natural wall look. It is adhered perfectly and only touch-ups needed have been due to their own accidental bumping or scraping. KITCHEN CABINETS/COUNTER: They are all IKEA from their customized kitchen design system. They chose the Sofielund finish with a white interior cabinet (they also have the option of ‘natural’) for the base. The uppers are the Faktum Cabinet with white interior, outer is Adel Off-White. and door is the Rubrik Frosted Glass. The laminate countertops for both the desk and the kitchen of the rv remodel were the IKEA Pragel in light oak. They bought two slabs and cut them themselves, whotout extra help, to fit the space. REMAINING CABINTRY: They kept the existing cabinets and painted them in a color that Angela found in the RV Favorites forum somewhere as matching the upper kitchen cabinets (IKEA Adel Off-white): Benjamin Moore Paper Mache. Angela gently sanded the cabinets before painting, nothing too crazy. Then she used a homemade chalk paint recipe and blended white non-sanded grout into the paint to get the paint to adhere well. It did require three coats in her application in the rv remodel, but results may vary. She gently sanded after it dried to remove any chalky bits and finished with a water based poly. They have had a few high-traffic areas show some wear, but other than that the paint has stayed on perfectly. WHERE DO YOU EAT? Angela and Jorge both practice intermittent fasting, nearly daily, so no one is sitting down for breakfast. Angela works from home and takes a break for lunch at her desk. For dinner, they pull out a folding table that is stored under the desk next to the RV freezer. It takes sixty seconds to set up and they have gotten used to taking this extra step. They sit on the couch to eat with the table at its medium height. WHERE DO YOU KEEP YOUR CLOTHES? Inside the bathroom to the right, slightly out of view in the pictrures, there is a large cabinet. They keep all their hanging clothes in here. The rest go in the cabinets above the bed. They do have one tub of seasonal clothes that they rotate out, but other than that, it is all inside. Their wardrobes are very minimal, consisting of about three pairs of pants and maybe 20 tops each. Various workout and lounging attire vary but not much. WHERE DO WE PARK? They use public campgrounds on trips. Long-term they find designated trailer parks (NOT Mobile Home parks, they affirm, as they find that for some reason these are often much less clean and safe) and pay $400/month plus electricity where they use power shore connection. At the last update of their blog after they completed their RV remodel project, in 2018, they were living in a trailer park in the northeast side of Portland, Oregon. Marie, the webmaster and owner of the Minty Lavender website, always thought that lighter colors are better to make spaces look larger. She did not spend too much: the curtains utilized were purchased in Ikea in color aqua cotton velvet. What she actually bought are large curtains, the largest she could find and processed the fabric to manufacture smaller bespoke curtains. She utilized aqua velvet and lavender tones. This is not the first rv remodel we scrutiny in this article that produced a shock in the aspect of the recreational vehicle, just by changing the curtains. Marie and her family had a pop up camper before they purchased this travel trailer and engaged in this small but enticing RV remodel project. Her children picked the theme and the mascot, a small cute hedgehog. She made a complete renewal of the upholstery, and as I explained above, she spent a lot of the time in the customization of the curtains. There is a lot more to see of this project in her website Happy Skampy. Featured by Momtastic (see link below), this is a small RV remodel project, where only wooden cabinets and carpets were renovated. This is an ongoing project, and we are expecting here updates. Each six months we review and update this article with the latest RV renovation projects. This is another RV model done on an Airstream. This is a 1968 model of twenty six feet lomg, where Joel, Mary, and two cats are living. This is their only picture in their Tumblr website. In the latest update we could find, by 2018 they were living in California, city of Santa Cruz, in a travel trailer park at the top of a hill. Lisa Mora, a well known renovation and RV remodel specialist, decided that her good and old travel trailer, with cream beige walls, needed a complete makeover. She changed completely the tiles and setup to “pink the ride” as she declares. This RV is called Elsie and it was presented already in the first version of this article in 2011. Few changes in this rv remodel took place since then. The dinette turns into a bed. The table was painted more recently with Krylon Plastic Fushion. The curtains were customized to fit the RV. Silver Trailer is a company with more than ten years of experience in the rental of refurbished Airstreams. These RVs have been rented for special events, television shows, magazines, film production, trade and commercial shows, print advertisement, and musical videos. Several years ago, in 2017, Mackenzie Edgerton and Blaine Vossler abandoned their jobs, and decided to pursue their real passion that was to travel through the United States, and handcrafted design. To finance this dream, the purchased an Airstream (another Airstream in our list or rv remodel projects), and started a complete RV renovation: not an easy one, as this Airstream from 1978 was completely weatherworn. Handcraft design specialists, they rolled their sleeves and completed this RV remodel with a signature adequate to their expertise: handcrafted, rustic, homey, but also very functional as a working studio, now that they work online in The Local Branch. Please write us in the comments below and let us know which of these RV remodel ideas is your favorite and if one of them gave you ideas that you can utilize and do a whole RV remodel in your own recreational vehicle. Next articleCamper Trailer Rental Pros And Cons: Should I Buy ?